In this short video below we offer you the ultimate Restorative savasana and teach you how to prop a blanket cradle for the head. If you would like to explore Restorative Yoga in greater depth or learn to teach the modality, then check out the details of our Restorative Course. The savasana blanket cradle provides a nurturing, supportive embrace for the head which allows the whole skull and neck to completely relax. It also helps contain energy in the body by keeping the chin slightly tucked, and stimulates the vagus nerve at the back of the head (occiput) activating the parasympathetic nervous system. Caitlin Harris who is one of our lead restorative teacher trainers learnt this savasana blanket cradle technique at a workshop with Lizzie Lasater (the daughter of Judith Hanson Lasater – the queen of Restorative Yoga!). 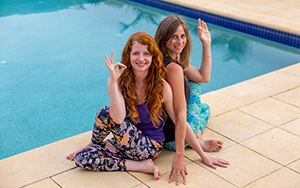 She teaches it on the Restorative Course and it is also a firm favourite with many our retreat guests. Fold 1 blanket to half stack size, with the top layer stepped 5cm from the bottom layer (ensure the open edges are on top). Place the folded blanket at the top of the mat, with the open edges facing towards the mat, and the neat folded edge facing away from the mat. Lie down on the mat, and bring the bottom edge of the blanket under the shoulders. Lift the head, pull the top layer of the blanket towards the head and curl it up to create a roll that fits in the curve of the cervical spine. Bring the head back down on to the blanket. Roll the side edges of the top layer of blanket under, tuck them underneath the head. Repeat with the bottom layer, tucking it in tightly to create a gentle compression in the back and sides of the head. The neck is supported by the blanket roll, the sides of the head are supported by the blanket, and the chin is slightly tucked towards the chest. Option to put an eye pillow over the eyes. Stay here for 20 minutes – enjoy!